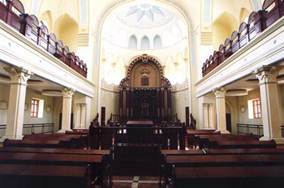 The interior of the synagogue prayer hall was restored to its former elegance under the direction of Rabbi and Mrs. Moskovitz. It had been used as a basketball court and then abandoned during the Soviet period. http://www.synagogue.kharkov.ua/photo.php?url=img/syna_01.jpg&name. Retrieved May 11, 2009 and subsequently printed in the writer’s report A Spring Visit to Ukraine – March-April 2009. As noted elsewhere, both the girls’ machon and the young women’s Akademia program meet in synagogue classrooms. Local STARS classes (70 girls and 30 boys), said Rabbi Moskovitz, use the classrooms at different times, and several club rooms accommodate various activities for children. The large dining hall in the basement provides hot lunches for 40 elderly Jews on weekdays and 70 on Shabbat, Rabbi Moskovitz stated. Additionally, Rabbi Moskovitz noted, a business club of young men between the ages of 20 and 40 gather in a smaller dining room for lunch every Friday to learn about business from successful older Jewish entrepreneurs. Rabbi Moskovitz has developed a (Chabad) Jewish Community Board of Trustees of some 50 individuals, each of whom contributes a minimum of $1,000 monthly to local Chabad operations. Within this group of 50 people, Rabbi Moskovitz noted, is an executive of four men (three younger men and one older man) who are exceptionally active; this group, said Rabbi Mosko-vitz, gives significantly more money, is much better informed, and recruits new members for the Board. Members of the Executive respect each other, Rabbi Moskovitz continued, and feel a strong responsibility toward the Jewish community. They believe that the synagogue must be a home to every Jew. The magnificence of the building itself attracts people, Rabbi Moskovitz noted. In all, said Rabbi Moskovitz, he raises enough money locally to cover all expenses for the community, except salaries and expenses for local STARS classes (which are supported by outside donors) and salaries and expenses for two Israeli teachers of Jewish subjects at the day school (who are supported by the Israeli Ministry of Education). In addition to the regular Board of Trustees, Rabbi Moskovitz continued, one wealthy individual, Alexander Feldman, distributes about $15,000 monthly of his own money through the synagogue. Mr. Feldman personally receives needy Jews at the synagogue who petition him for various types of support. In addition to offering funds for food, medical care, and housing, Mr. Feldman also pays lawyers to help individuals resolve legal problems. Alexander Feldman, right, controls the massive Kharkiv wholesale and retail Barabashovo mar-ket, as well as a number of other business concerns. /93039/#ixzz1SIkygBS2. Retrieved July 17, 2011. Another private sponsor, said Rabbi Moskovitz, distributes parcels of kosher sausage, kosher wine, and other products to the homes of elderly Jews in the city on their birthdays. Young people enrolled in the STARS program visit the homes of recipients and write reports of their findings, thus providing the synagogue with information about people who require their assistance. Chabad also owns and operates its own summer camp at a site outside the city. Plans to renovate it into a year-round facility await better economic times. 39. The Union of Orthodox Jewish Congregations of America (OU; New York) maintained a significant Jewish education presence in Kharkiv from 1992 until 2009. Their program included a Jewish day school, a downtown youth and student center, and a summer camp. The youth and student center operated a morning yeshiva and other educational programs for university students, a Saturday evening Jewish café for young people, programs for adolescents, and a dormitory that housed out-of-town high school pupils enrolled at Lycée Sha’alavim. All of these activities were led and supervised by teams of three young Israeli modern Orthodox rabbis and their wives who also taught Jewish-content classes at the Lycée; the rabbis remained in Kharkiv for terms of three years, then returned to Israel and were replaced by other young rabbis. The program was strongly Zionist in direction, encouraging participants to make aliyah and providing some guidance for those who elected to do so. Over time, the depth and breadth of the OU program contracted, reflecting a lack of leadership and commitment within the Orthodox Union, Jewish demographic losses in Kharkiv, and the economic crisis that began in 2008. In 2009, the program was closed upon revelation in the local press of a scandal involving local Kharkiv OU leadership. Dmitry Shuval, the 27-year old chairman of the Kharkiv OU program, was arrested for embezzling OU funds that were invested (unsuccessfully) in London; he had taken out loans on some OU property to finance his speculative efforts in the British capital. At the time of the writer’s most recent visit to Kharkiv (March 2011), the Orthodox Union was said to retain use of one floor (instead of the previous three floors) of the downtown building; some programs continued within this space, directed by a young modern Orthodox couple from Israel whose sponsorship was not clear to local Jews or to Rabbi Moskovitz. Rabbi Moskovitz and others anticipated that it was just a matter of time before the downtown presence ended. 40. The Jewish Agency for Israel office in Kharkiv supervises all JAFI operations in Kharkiv and the surrounding region and in Donetsk and the Donetsk region. In the absence of Elena Faingold, the director of the JAFI office, who was out of town, the writer met with George Faingold, Ms. Faingold’s husband, and with Anya Landberg, the director of JAFI education programs in the region. Mr. Faingold said that aliyah from the area (Kharkiv and Donetsk) was “very high” in 2010, totaling 440 people compared with only 250 in 2009. Even greater emigration to Israel was anticipated in 2011, he continued; he noted that 110 people had already left for Israel during the first three months of the year. The economic situation was “pushing” people out of Ukraine, he explained. The situation in small industrial centers near Donetsk was especially dire, he continued; these were cities with obsolescent single industries in metallurgy or related fields. Young people in these areas saw no future for themselves in Ukraine and were eager to leave. Ms. Landberg commented that many Jewish young people in the area identified strongly with the Jewish people and with Israel because they had attended JAFI summer camps and also participated in Taglit (birthright Israel) and other programs. Ms. Landberg described JAFI educational programs in the region. In all, she said, JAFI operates 13 Hebrew ulpans, of which six are located in Donetsk, three are in Kharkiv, and the remainder in other cities. Each ulpan meets twice weekly in two-hour sessions and includes Jewish identification content, she said. Ms. Landberg noted that all JAFI ulpans now require fees from participants, whereas the Israel Culture Center in the same building offers an ulpan free of charge. The JAFI Youth Club in Kharkiv attracts 70 young people on a regular basis. They range in age between 13 and 25, said Ms. Landberg, and are divided into age groups for various activities, including holiday celebrations and intellectual games. As many as 400 come for special events, such as Israel Independence Day. JAFI operates two week-long summer camp sessions, enrolling a total of 250 youngsters and students from the region. One camp session is for teenagers and the other is for students. Although summer camp is by far the most popular JAFI youth activity, said Ms. Landberg, the length of the sessions seems to be reduced from one year to the next because of financial concerns. JAFI rents a local camp facility near Kharkiv, she continued, but problems have arisen with this site and JAFI will need to find another place for future use. In response to a question about winter camps, Ms. Landberg said that the last winter camp was held about five years ago; JAFI no longer has funds for winter camp programs. Taglit (birthright Israel) trips to Israel always have full rosters, stated Ms. Landberg. JAFI operates three from the region (Kharkiv and Donetsk), one each in winter, May, and August. Each goes with a full busload of 40 participants and a waiting list of people left behind. Hillel also has its own Taglit trip, she noted, as does the Chabad STARS program. 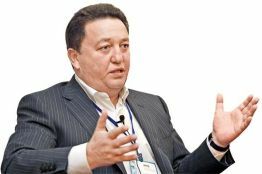 Alexander Feldman, a native of Kharkiv, is the principal owner of Avec, a company with major interests in property development, food processing, and transportation. He is the founder of the Ukrainian Jewish Committee (modeled loosely after the American Jewish Committee) and also is a member of the Rada, the Ukrainian parliament. See pages 54-55 about Lycée Sha’alavim. Mr. Faingold, a native of Vinnytsia, is an experienced emissary, having previously worked for the Joint Distribution Committee in the former Soviet Union. The writer later met with Mrs. Faingold in Donetsk. See pages 77-79. See pages 67-80 for more information about the Donetsk area.